Kornerupine and prismatine were introduced independently by Lorenzen in 1884 (but published in 1886 and 1893) and by Sauer in 1886, respectively. Ussing (1889) showed that the two minerals were sufficiently close crystallographically and chemically to be regarded as one species. However, recent analyses of boron using the ion microprobe and crystal structure refinement, indicate that the boron content of one tetrahedral site in kornerupine ranges from 0 to 1. Kornerupine and prismatine, from their respective type localities of Fiskenaesset, Greenland and Waldheim, Germany, are distinct minerals, members of an isomorphic series differing in boron content. For this reason, we re-introduce Sauer's name prismatine for kornerupines with B > 0.5 atoms per formula unit (p.f.u.) of 22(O,OH,F), and restrict the name kornerupine sensu stricto to kornerupines with B < 0.5 p.f.u. Kornerupine sensu lato is an appropriate group name for kornerupine of unknown boron content. Kornerupine sensu stricto and prismatine from the type localities differ also in Fe2+/Mg ratio, Si - (Mg + Fe2+ + Mn) content, Al content, F content, colour, density, cell parameters, and paragenesis. Both minerals formed under granulite-facies conditions with sapphirine and phlogopite, but kornerupine sensu stricto is associated with anorthite and homblende or gedrite, whereas prismatine is found with oligoclase (An9-13), sillimanite, garnet, and/or tourmaline. Occurrences at other localities suggest that increasing boron content extends the stability range of prismatine relative to that of kornerupine sensu stricto. 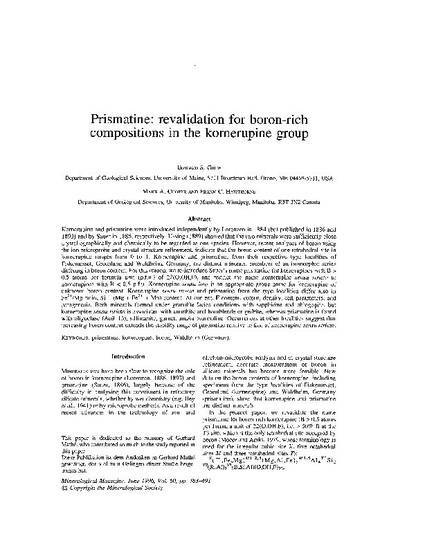 Grew, ES, Cooper, MA, and Hawthorne, FC, 1996, Prismatine: Revalidation for Boron-Rich Compositions in the Kornerupine Group: Mineralogical Magazine, v. 60, p. 483-491.